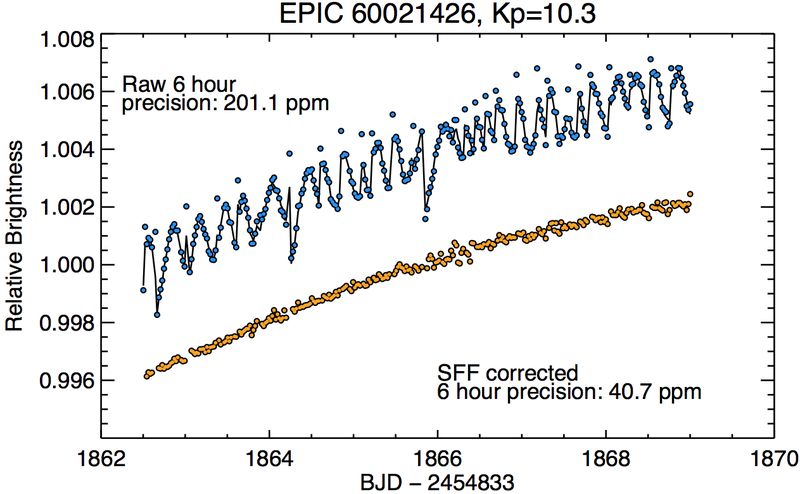 Comparison between raw K2 and corrected photometry. Figure 5 for Vanderburg & Johnson (2014). 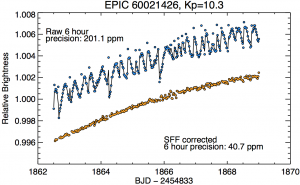 Read a neat paper from Andrew Vanderburg of John Johnson’s Exoplanets group at Harvard about working with data from the upcoming K2 mission. 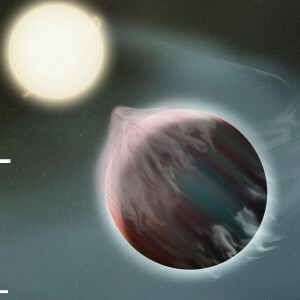 Having suffered failures of two of its reaction wheels, required to accurately point the telescope, the Kepler mission has ended its nominal science investigation. However, clever engineering will allow the spacecraft to keep operating and doing exciting astronomy as the K2 mission. Among other goals, the K2 mission will continue to look for transiting exoplanets, which involves looking for the shadows of planets as the occult their host stars. However, small attitude tweaks needed to keep the K2 spacecraft accurately pointed result in fairly large artificial variations in the measured brightnesses of target stars. Removing the effects of these tweaks from K2’s data can be quite challenging, but Vanderburg & Johnson’s recent paper describes one technique for doing that. By carefully tracking the centers of target stars as they drift across the K2 CCD camera, their technique allows them to remove quite large and complex artificial variability and to recover the actual brightness variations of target stars. From the paper, the figure at left shows how well they do: the blue dots at the top show the raw measurements, with the artificial variations from attitude tweaks apparent as discontinuous jumps. By carefully modeling the exact position of the target star and removing the effects of its motion across the CCD, the technique produces a much more accurate measurement of the actual brightness variations of the target star, orange dots at bottom. Applying these techniques to many target stars monitored during one of the K2 engineering tests, Vanderburg & Johnson showed they can produce data nearly as precise as the original Kepler mission — almost as good as sending an astronaut repair team to fix the Kepler spacecraft, but all it took was some sophisticated numerical modeling and a laptop.